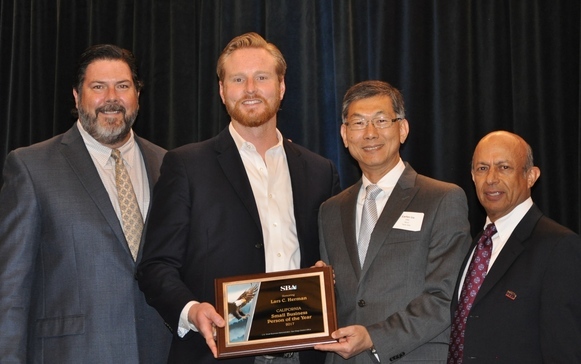 Lars Herman, President, Herman Construction Group, Inc.
Photo above: (L to R) Nominator - Lawrence McMahon, Executive VP/Surety Manager, Construction Services Group, Alliant Insurance Services, Inc.; Lars Herman, President, Herman Construction Group, Inc.; Carlos Liu, SBA Lead Business Opportunity Specialist, San Diego; and North San Diego SBDC Director Sudershan Shaunak. IO Environmental and Infrastructure, Inc.
Photo above: (Left to right) Jill Andrews, SBA Acting District Director, San Diego; Michael Bilodeau, CEO, IO Environmental and Infrastructure, Inc.; Nominator - Janalla Roberts, Manager, Small Business Program, Tetra Tech EC, Inc. and Carlos Liu, SBA Lead Business Opportunity Specialist, San Diego. Photo above: (Left to right) SBA San Diego's Jill Andrews, Acting District Director, and Cynthia Harris, District International Trade Officer; Victor Castillo, Director & Deputy Sector Navigator, Global Trade & Logistics, San Diego CITD; and Jeff Silver of Rough Draft Brewing Company. President, Southwest Boulder & Stone, Inc.
Michelle Smith McLeod of Southwest Boulder & Stone, Inc.; and Nominator Christine Hoy, VP, Chase Bank. 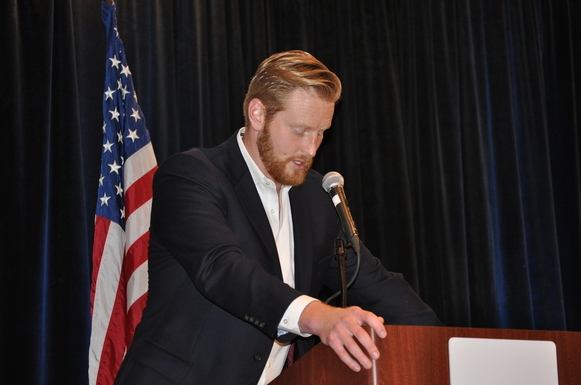 North San Diego SBDC; and John Engstrom, SBA Business Opportunity Specialist, San Diego. Nominator: Amanda Caraker, Proposal Writer, Interpreters Unlimited, Inc.
Photo above: (Left to right) North San Diego SBDC team Amy Balch, Secretary; Lynn Pittman, Outreach Specialist; Martin Kleckner III Ph D., Business Advisor; Cheryl Brown, Senior Business Advisor: and Linda Harasin, Senior Business Advisor; nominator - Jill Andrews, SBA Acting District Director, San Diego; and Sudershan Shaunak, Director, North San Diego SBDC. 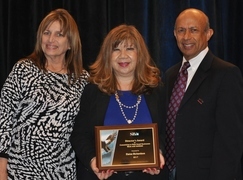 Photo above: (Left to right) Lynn Pittman, Outreach Specialist, North San Diego SBDC; Elaine Richardson, Manager, Small Business Development, SANDAG; and nominator - Sudershan Shaunak, Director, North San Diego SBDC. 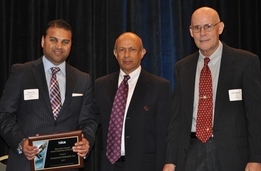 - Wes Paul, Business Advisor, and Sudershan Shaunak, Director, North San Diego SBDC. Elizabeth Valenzuela Banker CEO/President, Shore Solutions, Inc.
Photo above: (Left to right) Sudershan Shaunak, Director, North San Diego SBDC; nominator - Dalcia Paramo, VP of Operations, Shore Solutions, Inc.; Anthony Vigil, Retired, Former SBA Deputy District Director, San Diego; Elizabeth Valenzuela Banker CEO/President, Shore Solutions, Inc.; and SBA San Diego's John Engstrom, Business Opportunity Specialist. 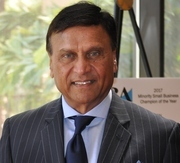 - Sudershan Shaunak, Director, North San Diego SBDC. 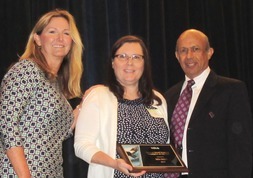 Small Business Liaison Officer, ViaSat, Inc.
Photo above: (Left to right) Sylvia Gaffney, Government Subcontracts Counsel, ViaSat, Inc.; Lilia Smith, Small Business Liaison Officer, ViaSat, Inc. and nominator - Sudershan Shaunak, Director, North San Diego SBDC. 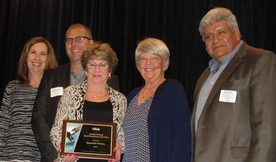 The event was held at the San Diego Marriott in La Jolla California and attended by 317 small business champions, advocates, winners and well-wishers. This year fifteen small businesses and advocates were recognized locally, of which three received state or regional awards and two received national recognition as well. 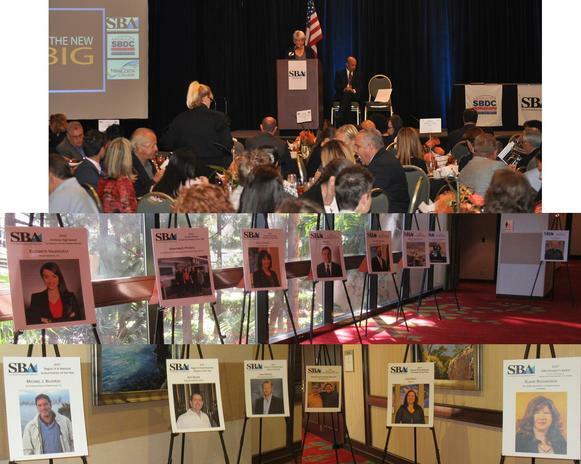 The North San Diego Small Business Development Center and San Diego District SBA staff organize the event annually. 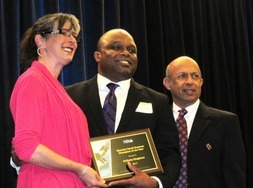 Photo above: (Top) Jill Andrews, SBA Acting District Director, San Diego, at podium providing opening remarks. (Middle and bottom rows) Winner posters. #1 - I would not get nervous. #2 - Be on time, because the SBA told me that I had two minutes…so I’ll do my best to be under five. I can tell you that, at the end of the day, it’s not the successes…but the failures. It’s how we get back up when we get knocked down. It’s how we respond when we get “bloodied up in the arena.” It’s where our faith lays when things seem increasingly impossible day in and day out. … AND IT’S HOW WE LEAD THROUGH THOSE TIMES AND INSPIRE OTHERS TO GET BACK UP WITH US! We live in a country of opportunity and we are all proof that the American dream is still alive…all you have to do is get back up! “We’ve got an administration right now that is championing small business through deregulation, tax reform and increased spending…this is exciting stuff! !” as Vice President Pence said…and the best is yet to come. I’d like to thank my wife, Jenna, who during this time has not only been an incredible mother to our three children, but also the world’s best wife and my biggest supporter. Thank you for your incredible faith and I love you so much. My parents for all the support and time they’ve poured into the business and helping make it what it is today. Love you guys! Thank you Bill for being an incredible Mentor and friend…and somehow convincing your wife that not retiring and coming to work for me was a good idea. Love you man! You still can’t retire! Thank you to my business partner Steve Smidt and the entire Herman Construction team - this is really about the dedication each of them has to the company and to each other…truly special. Thank you to my sponsor, who likely happens to be the only person in this room taller than me, Larry McMahon, with Alliant Insurance. Thanks for believing in me and giving me the support I needed when I was the ‘new kid on the block’. Lastly, a BIG THANK YOU to the SBA. Your programs allowed me to get my foot in the door, your education seminars increased my knowledge of the market, and when I’ve needed help or grace…you all have been there for me! May God continue to bless our country, our country’s leadership, our businesses and each other. Please pray for our Service Men and Women and HIRE VETERANS when you have the chance. National Small Business Week again with us next year, April 29-May 5, 2018.